I had a lot of options activity in January. I closed puts in TWGP and CAT. I had options expire in INTC and BBVA. I also opened new options in TGT, ESV, KO, and INTC. My total profit for the year is $-163.00. Yes it’s negative due to a loss on the TWGP put of $1260. I’m glad to be completely rid of that company and can now move forward. I’ve updated all of these trades on my Options tab. I earned $249.94 in dividends for the month. This is an increase of 209% from last January. My total year-to-date dividend income is $249.94. I’ve updated my dividend income on my Dividends tab. My expected forward 12-month dividend income has increased to $9330.19 from $8644.11, an 8% increase in one month. You can find my all of my monthly dividend information from the Dividends page. Three of my stocks increased their dividend payments in January. They were NSC, NVS and OHI. I’ve already mentioned these increases and they can be found on my Dividend Increases label. I set a lot of new and harder to reach goals for 2014. All of my goals can be found on the Goals tab. I mentioned closing on a commercial property for my business. I’m still busy working on the build out of the inside. It should take another 3 months to be ready to move into. I am behind on a post about this but promise to get one up soon. I’ve had a full month of production out of my solar system. I’m happy with the results but my bill is pro-rated so I still haven’t seen the impact of a full month of production yet. I’ll make sure and post some results soon. I’m now at $599k, up from $596k. This is an increase of only 3k mainly due to the markets moving lower. I’m also using Zillow to calculate real estate values now. My expected dividends for February are $662. This would be a nice increase over the previous year. It’s going to be tough to keep the new purchases to around $10k/month as I’m getting ready for taxes and have less additional income in the first quarter. I’m getting close to $10k in forward annual dividend income. This will be a nice milestone to hit. Wow!! Thats an awesome progress, AAI. $9999 in investments in one month….at this rate you will be hitting $1M net worth in no time. Congrats on all the dividends. Thanks! Although I don’t think Feb. will have this much in purchases, I should be able to make up for it in the last quarter. I hope to hit $1M net worth sometime next year. In February I can purchase shares for 2.000 EUR. And that is for me awesome! I can do that not every month! That’s great D-S. Keep up the consistency and you’ll be FI in no time! I also have a long ways to go myself. Those are awesome results! That is some empire you are building. It resembles a Monopoly board. I hope to purchase my first income property this year. If dividend investing is the expressway to wealth, then real estate is the Autobahn. Keep up the great work! Thanks buddy. So far my real estate purchases have been pretty good. I’m getting both cash flow and capital appreciation so I can’t complain. Good luck in your hunt for your first property. My target is half equities and half real estate before retirement. Holy mother of goodness. 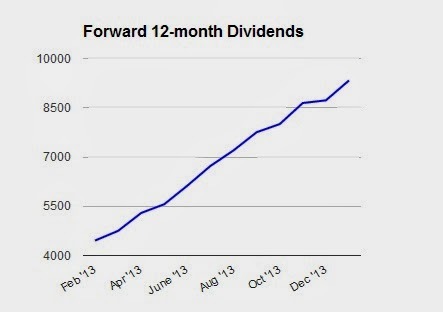 Could be misread sarcasm on my part, but a $686.08 increase in your forward 12-month dividends is definitely not small. Keep up the good work! Definitely looking forward to hearing about your commercial property and the finances behind that. Certainly a totally different animal from residential so I welcome your added perspective. Lol, that wording was left from last month and I corrected it. I certainly don’t consider that a small increase. I have a long ways to go to hit 14k in forward income for the year though. I’ve been so busy I haven’t had time to write up a post about it but will get one out there. I think it will be a great investment in the long run. Not for an average joe so these results dont relate to 90% of the people perhaps. If someone has so much money, sure yearly dividends can be that much and even 2 or 3 times that much. No problem then if you have 10k to invest every month. Many people earn 10k-20k / year trust me. You’re right, these may not be average results for average folks. I started out as an average person though and just worked really hard to get to where I am. I’m just documenting my progress and hopefully it will motivate people to start saving/investing for their future. Everyone has a different retirement goal and the main point is that you are at least working towards that goal. Wow, Just WOW AAI. Great work and congratulations! Thanks, it was a good start to the year. Let’s see if I can keep it up. It’s fun to do these monthly updates to see a little progress each month. I keep getting one step closer to FI. Great blog. I have recently created a blog about my journey to finacial freedom. Your blog has given me some great ideas. I hope I can inspire a few people to start taking action to move towards their financial goals. I think I have some things to share that poepl might learn from. I aslo think that making my goals public will help me hold myself accountable to them as well. I am looking forward to the journey and will be following yours. I hope you can take the time to stop over at my blog to see if we have some things in common or something you might pick up from my journey. Thanks, I’m glad that you enjoy it and it has inspired you. That’s one reason I like to post updates and keep up with my trades. I took a quick look at your site. That’s a giant net worth for your age, so congratulations! I’m curious why 100 million is the number you are shooting for. I look forward to reading more. Is your net worth tab calculating correctly? It looks like your liabilities line under IRS Escrow doesn’t appear as a (negative) so it’s adding $75k, whereas you may want to be subtracting $75k? Thanks for catching that. For some reason the 75,000 was showing up colored red even though it wasn’t a negative. I figured when I changed to using the Zillow values, that’s why the large up swing. Unfortunately my net worth only moved up 3k in reality 🙁 It was nice while it lasted lol. Wow, great job! Can you discuss your large purchase of 100 shares in ESV? I’m not overly familiar with this company so was curious why you took such a large position. Thanks! I have a couple posts I mentioned why I purchased ESV shares. If you search my blog in the “Search This Blog” field for ESV you’ll find those articles. If you have any other questions let me know. Thanks! You are doing a heck of a job yourself. Good luck on the merge to WordPress. I’ve been considering the move myself. The movement of your business regarding the graph looks good. I really am looking forward to have a good business just like yours. Its important that we do our best to keep our Property Investment Portfolio successful and that is what I am targeting this year for that to happen.